Meal delivery services, meal kits, and food boxes are the perfect gift for any foodie on your list! These top boxes allow your loved one to pick what they want based on their interests and preferences and allows you to quickly check gifts off your holiday list. Meal delivery and baking boxes are literally the gift that keeps on giving all year long– and don’t be surprised if you get some delicious treats out of the deal, too. CrateChef is a bi-monthly subscription box curated by top chefs, celebrity chefs, food bloggers & influencers, and more. They send artisan foods, recipes, and kitchen supplies in each box, typically with a cookbook or recipe cards from the featured chef so you can put your items to good use! You can buy a single box for $49 or subscribe for 3 deliveries at $44 each, plus shipping. Foodstirs curates a fun, family-friendly and seasonal baking kit using their healthier baking ingredients, delivered straight to your door every other month! They use organic and non-GMO ingredients, plus natural food dyes, fair trade chocolate, and more. Kits include all dry mixes, instructions, and decorations; subscribers just need to add wet ingredients (like eggs, oil, and milk). $18.99 plus shipping, every other month. Discounts on 3, 6, and 12 box prepaid plans. Check out our Foodstirs Reviews to learn more! COUPON: Get 20% off site-wide with code MSA20! Carnivore Club is a subscription box that sends a curated package of artisanal cured meats from around the world. Each month’s box is themed around a different producer that specializes in a particular style of cured meat. Boxes feature everything from French charcuterie and Italian salumi to Spanish chorizo and South African biltong. $50/month for subscribers; $55/month for one-off gifts. Check out all of our Carnivore Club Reviews to learn more! Plated delivers portioned ingredients and recipes that will bring the fun back to the kitchen! Regardless of cooking level, a variety of recipes is available to easily meal plan each week. You can purchase gift cards here. You’ll choose exactly how many servings, meals, and weeks you want to gift, from $56 (for one week of 2 meals with 2 servings each) up to $637 (for 4 weeks of 4 meals/week with 4 servings each). Your gift recipients will be able to apply their gift card balance toward any plan they like. Plans range from $9.95 to $11.95 per serving. Check out all of our Plated Reviews to learn more about this subscription! Candy Club ships you “Up to 3 pounds of candy” (from classics to contemporary favorites) packed into three of Candy Club’s 16 oz. signature containers. Candies range from nostalgic varieties, to sweet or sour gummies, and even chocolate, jellybeans, and more– and their selection changes regularly. $29.99 + $8.99 shipping per month. Yummy Bazaar’s Destination Food Club sends authentic and delicious foods from around the globe. The World Sampler Box includes 5-8 products, and it’s a fun, low-budget pick for anyone who loves trying new things and exploring world flavors! You can choose a 3, 6, or 12 month prepaid gift subscription on Yummy Bazaar’s website. $9.95/month, with free shipping to the contiguous US. Read our Yummy Bazaar Destination Food Club Reviews to learn more. SoBakeable includes pre-measured labeled ingredients, step-by-step instructions and kitchen tools to inspire creative desserts. Every quarter they teach you a new decorating technique, with access to in-app video tutorials. $36.95 every other month. Check out all of our SoBakeable Reviews to learn more! Every quarter, RawSpiceBar will send six resealable packets of freshly ground, authentic spice blends and globally inspired recipes to use them in. When you buy, the gift recipient will receive an email with information on how to sign up and redeem their code. Starts at $64 for 6 months (two shipments). Check out all of our RawSpiceBar Reviews to learn more about this subscription! Home Chef delivers fresh portioned ingredients and easy-to-follow recipes based on your dietary preferences. The key to Home Chef is that the meals you receive take about 30 minutes to prepare! Unlike other meal kits, they also offer easy add-on no-cook lunches and breakfast options, too, making this a great choice if you’re looking for a gift to help cover more than just dinner. Starting at $49.80 a week ($9.95 per serving). Check out all of our Home Chef Reviews to learn more! From grab-and-go snacks to pantry staples like nut butters and supplements, Clean.Fit curates monthly boxes of delicious, health-minded foods from brands big and small. After a holiday of indulgent dishes, this subscription will be a much-appreciated jumpstart into a fit new year! $34.95/month + free shipping. Check out our Clean.Fit reviews to learn more! Blue Apron is one of the most popular meal kit subscriptions for good reason! Its recipes feel like they’d be right at home at a hip bistro, and its pre-portioned ingredients make cooking so easy, fun, and impossible to mess up. It’s a great gift for recent grads getting started at adulting, newlyweds, or anyone with an interest in getting more comfortable in the kitchen. Plans start at $47.95. Ships to US only. Check out our Blue Apron reviews! 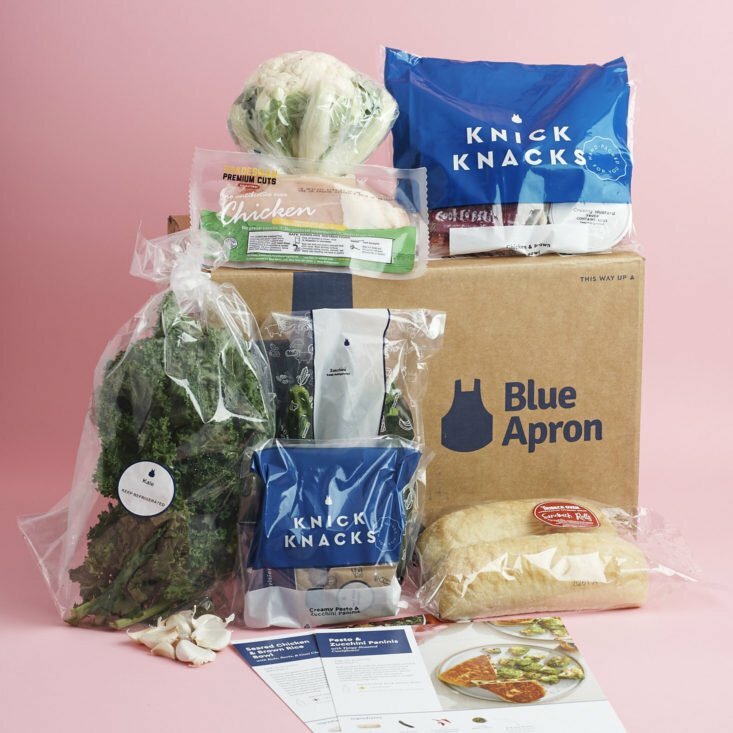 COUPON: Save $50 off your first 2 Blue Apron boxes here! I don’t understand this! but i’m happy to subscribe.